When I last wrote about my hunt for HK over a week ago, that entry didn't exactly end on a happy note. 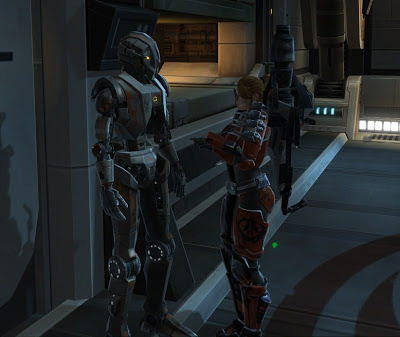 I thought that the quest chain had started off well, but when I got to the bit where you have to scan for randomly scattered droid parts I quickly concluded that it was tedious as hell and probably not worth my time. The comments that I received in reply to that post commiserated somewhat, but also tried to reassure me that it wasn't quite that bad, and that I should try to enlist the help of other people for better results. Still, I wasn't really convinced and didn't feel like even giving it another try for several days. Last night however my former guild leader (who recently started playing again) whispered me about how he, too, had found the HK part on Taris in "only" twenty minutes and that the search wasn't so bad if you could keep your mind occupied with something else in the meantime, for example by watching tv on the side. Since I had a day off today, I decided to give it another go. I travelled to Taris, fired up the TORWars podcast and started scanning in what I figured was roughly the right area. I hadn't been meandering up and down the swamp for very long yet when a random lowbie belonging to a higher level legacy stopped next to me and asked me how my search was going. When I complained about how tedious it was, he offered to show me where he had found his own HK part. While the placement of parts seems to be random, I still appreciated the gesture and followed him. I didn't end up finding anything at the location to which he led me, but I still thanked him for his kindness. Incidentally, he did lead me quite far away from where I had begun my search, which makes me think that I might have actually started scanning outside of the designated area anyway. Feeling grateful that the lowbie had at least set me vaguely on the right track, I continued to scan the area around the spot that he had shown me. I ran into a Jedi who was obviously searching too and offered to group up with her to make things faster for both of us, but she was unresponsive to my whispers. Shy, perhaps? After about forty minutes of scanning I was starting to get seriously tired of the whole thing again, podcast running in the background or not. 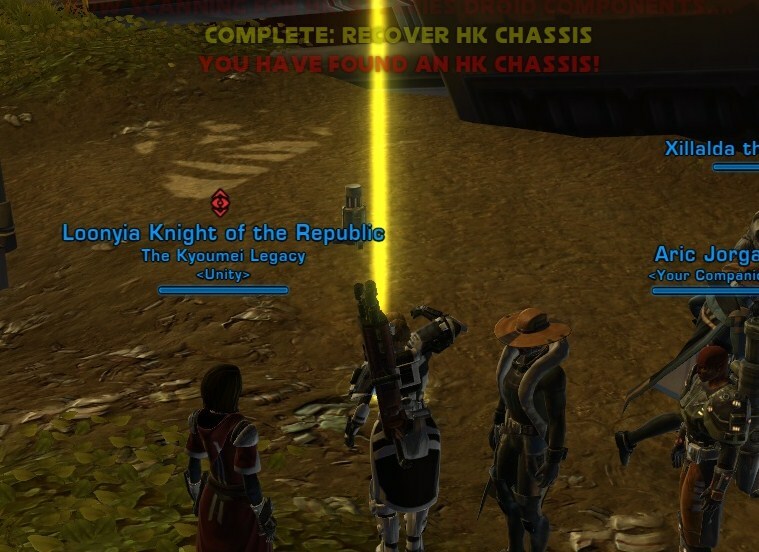 I was just going off on a moan in guild chat about it (which prompted a friendly guildie to offer help), when suddenly out of nowhere two other players converged on a spot right in front of me (including the silent Jedi), and lo and behold, an HK part appeared at my feet! My hope in actually making some progress with Project HK was restored. I continued to Coruscant, and searching the Jedi Temple there felt like a piece of cake compared to the swamps of Taris, considering that the area is much smaller and very obviously walled off. It took me less than five minutes to find what I wanted. After taking a bit of a break, I sent my scanner to my agent and decided to tackle the Dark Temple approach on Dromund Kaas next. This looked like another pretty large area and I could soon feel my hope sinking again as I worked my way up the side of the south-western cliff face without finding anything of interest. However, following Green Armadillo's and Rohan's advice, I kept an eye on general chat and it didn't take long until someone exclaimed that they had just located the HK part. I immediately asked where they were and they threw me a group invite. I couldn't see them though because they were on a different instance of Dromund Kaas. I tried to switch but it wouldn't let me since "you can't do that in an unsafe area". Errr... since when? I panicked and was sure that my chance to find the part had already passed as it only remains up for a minute or so after it's been found, but then I saw the two lowbie Sith whose group I had joined talk in party chat about how they hadn't actually completed the dig yet, they just knew that they were standing about ten metres next to it. After a bit of driving around I finally managed to find a spot where the game would let me switch instances, and after what felt like the longest loading screen ever I hurried over to my two little Sith friends just in time to see them dig up their find at last. I picked it up quickly and thanked them profusely for being so helpful and saving me so much time. Unfortunately another guy who had also been looking for the part was even slower than me to make it to the dig site and didn't arrive before the item had despawned again. He must have felt gutted. Feeling pleasantly surprised by how quickly I was progressing, I decided to go for gold and made my way to Hoth, where another wide and open plain loomed intimidatingly. However, I got lucky once again and located the HK part there on what was only my third scan (though it then took me about five minutes to find the exact spot because I kept overshooting my goal somehow). Inspired by my friendly helpers from Imperial side I made sure to announce my find in general chat before actually attempting to dig it up, but nobody else seemed to be looking for that particular item at the time. That left only the two flashpoints! And oh look, my pet PvP tank just came online! It didn't take long to pick up two damage dealers to form a full group, and I decided to take my chances with a random hardmode flashpoint for the extra reward. That gamble paid off as we did indeed get False Emperor as our random, which was one of the ones that is needed. One of the dpsers commented that this was his third "random" flashpoint of the day and that every single one of them had been False Emperor, which made me laugh. We breezed through it quickly and I was pleased to see that you can indeed get the drop from hardmode as well. (We were a bit unsure about that as Dulfy's guide specifically states normal mode as the source.) As a bonus, Malgus dropped his snazzy speeder and I won the roll for it! We queued for HM Maelstrom Prison immediately afterwards, which didn't take very long either, and then I actually had all the parts! At this point the other dpser piped up to say that he was still on the quest as well and only missing the part from Hoth now, so we returned to there and I was honestly a bit startled to find myself running laps around the wreck of the Ambria's Fury for someone else, after how turned off I had been by the whole scanning idea to begin with. The commenters on my previous post were right though; it wasn't nearly as bad in a group. We unearthed the quest item in about ten minutes. 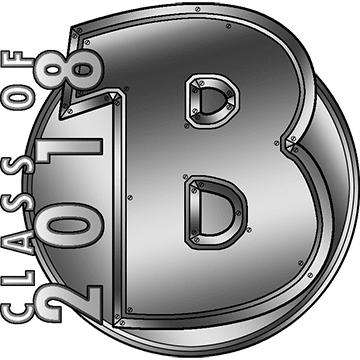 Finally we returned to Section X to tackle the final heroic in the chain there, as I had been told by multiple sources that this was actually a "proper" heroic that couldn't easily be soloed with a bit of skill and gear. With a well-geared team we cut through it very quickly though, and at last both me and my guildie received our very own assassin droids. A little bit of both is probably appropriate.